finally decided to pay Sky Vue a visit last weekend. 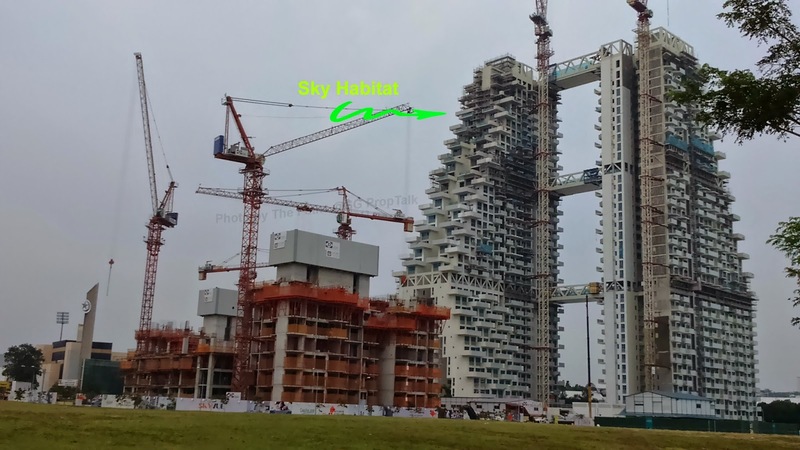 Sky Vue is one of two CapitaLand projects located in Bishan Central - the other being the Moshe Safdie-designed Sky Habitat next door. When Sky Vue was first launched back in September 2013, it made news for selling 85% of the 505 units during the first weekend of its launch, at an average price of $1,500psf. However, sales have tapered since and following the poor market sentiments during the past year, units have been moving at a snail pace. 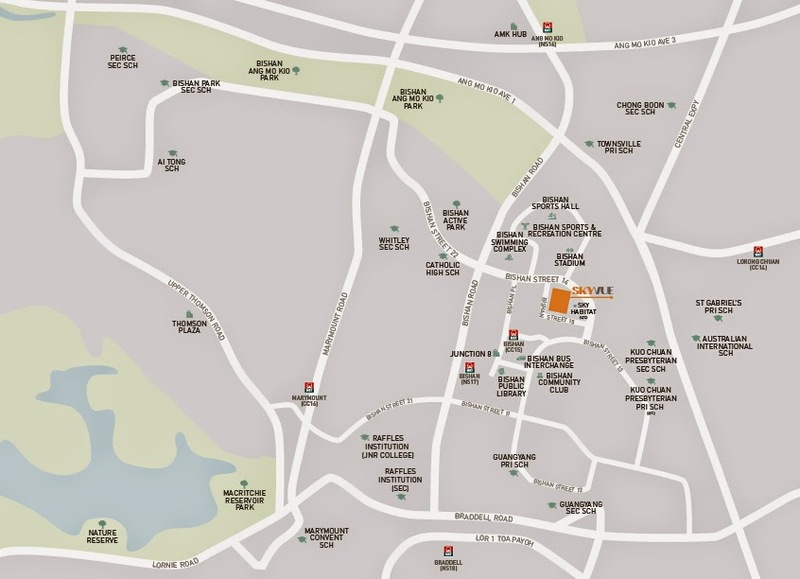 The sales gallery is located at a plot next to the actual site of Sky Vue - if you are coming via Bishan Road, turn into Bishan St. 14 and then make another turn into Bishan Place. 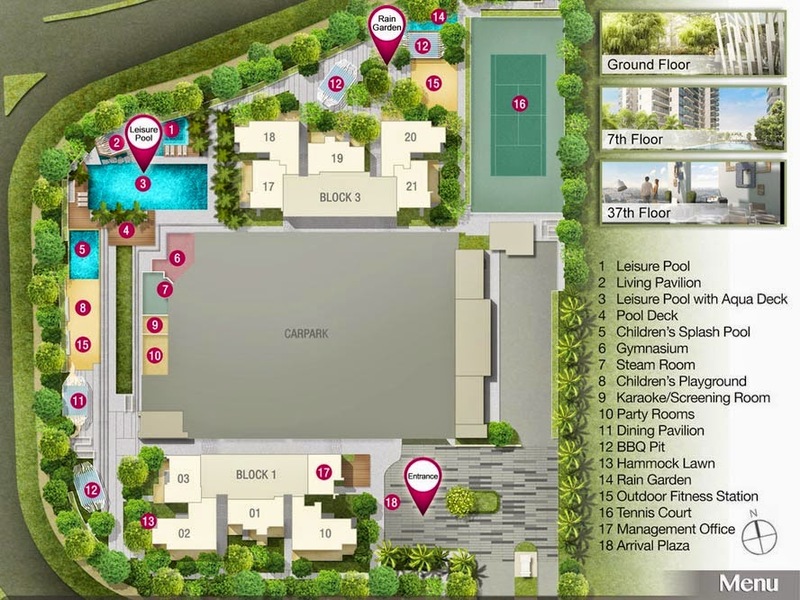 The actual site itself is located one street away - entrance into the development is along Bishan St 15. 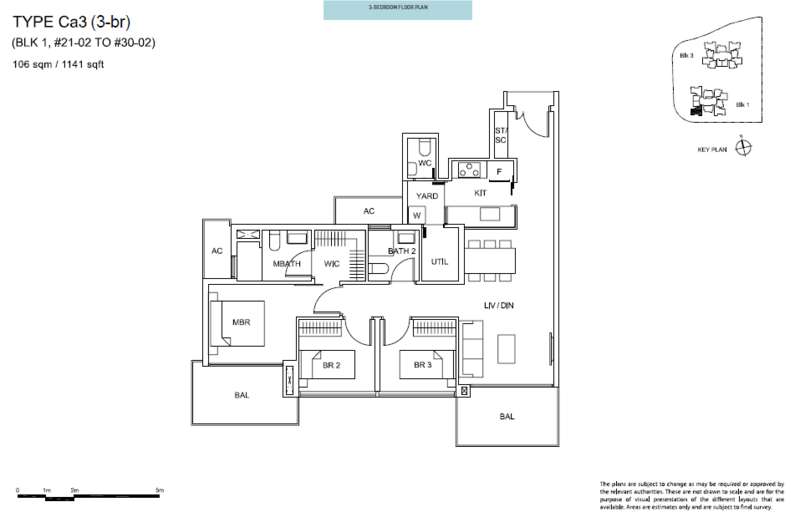 Sky Vue resides on a plot of about 129,000sqft, which is almost identical in size to the Sky Habitat plot. The 99-year leasehold project consists of 2 towers of 37-storey each. 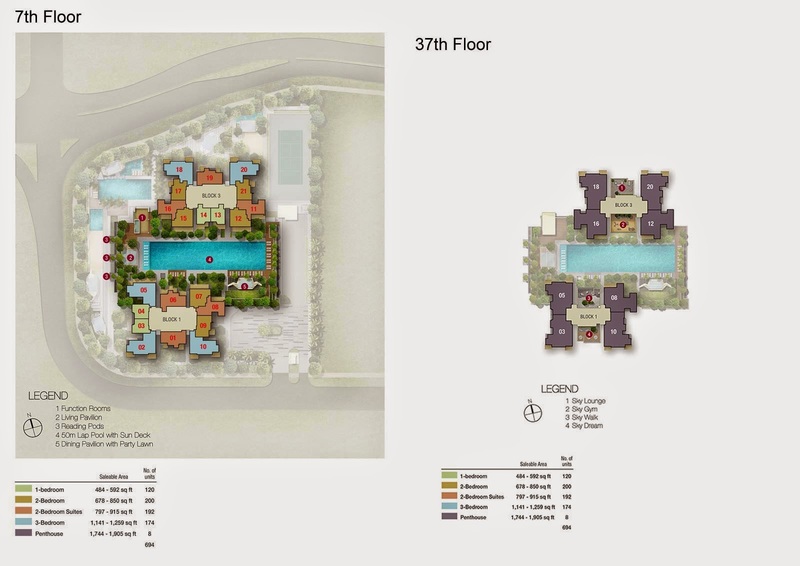 The development houses a total of 694 units, with unit types ranging from 1- to 3-bedders as well as penthouses. The wife and I were told that unlike its next-door neighbours, units at Sky Vue are generally "smaller" and this is a calculated decision by CapitaLand to make the purchase quantum more affordable for the more budget conscious buyers. Facilities wise, Sky Vue's offering is quite generous and are spread over three separate levels within the project - on the ground level (where you find the leisure and children pools, karaoke and screening room, and a tennis court), the 7th floor (which houses the lap-pool, dining pavilions and function rooms) and last but not least, on the top-most 37th floor (where the gym and sky lounge are located). The wife and I reckon that the view you get while you are running your lungs out on the treadmill should be quite spectacular. And with parking, you can expect the usual "1 lot-to-1 household" that is typical of most new projects these days. But unlikely most developments, Sky Vue offers above ground, multi-storey parking. There were 3 showflat types (1-, 2- and 3-bedders) on display at the chic and funky sales gallery. We shall focus on the 3-bedroom unit as per usual. 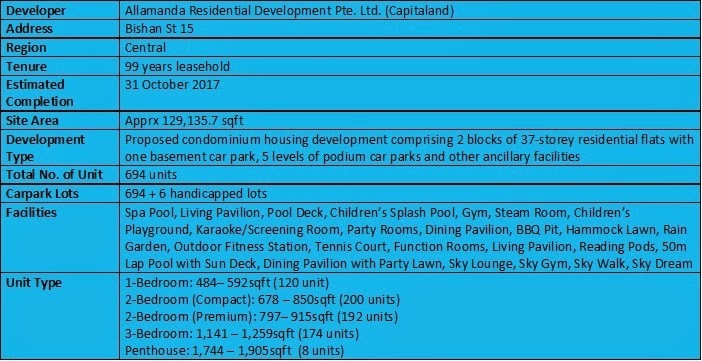 The unit concerned is a 3-bedroom apartment of 1,141sqft (Type Ca3). The first thing that struck us when we entered the unit is the large storage cupboard along one side of the entrance walkway. This is nicely flushed against the wall and will come in handy for general storage purposes, especially welcomed for smaller apartments these days where finding enough storage space is always a challenge. The kitchen is what you see before arriving into the living/dining area. This is a narrow strip that may already be a tad "cramped" with just two people working side-by-side. It comes equipped with appliances from Electrolux (i.e. hood/hob, oven and fridge) and glass partition atop the kitchen sink area that looked into the living/dining area. 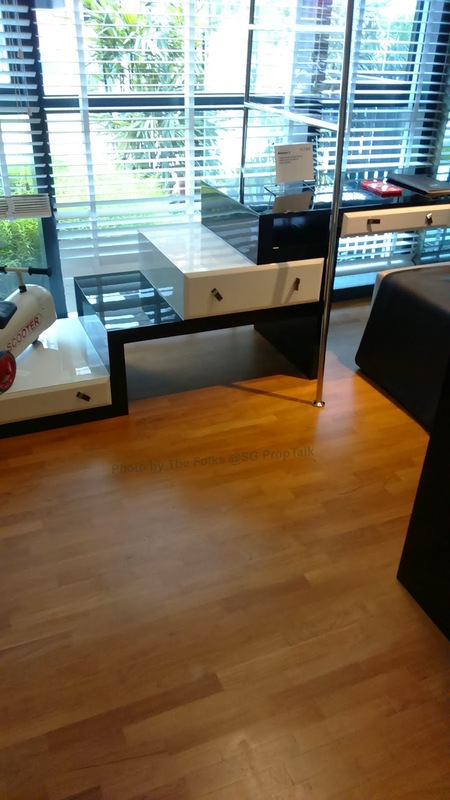 The wife and I have been to quite a few showflats installed with Electrolux kitchen appliances and we haven't been excited by what we have seen so far - the appliances looked somewhat dated and not too appealing. The other thing we liked about the unit is the fact that it actually has a yard - a small one at that but still a proper "functional" space. 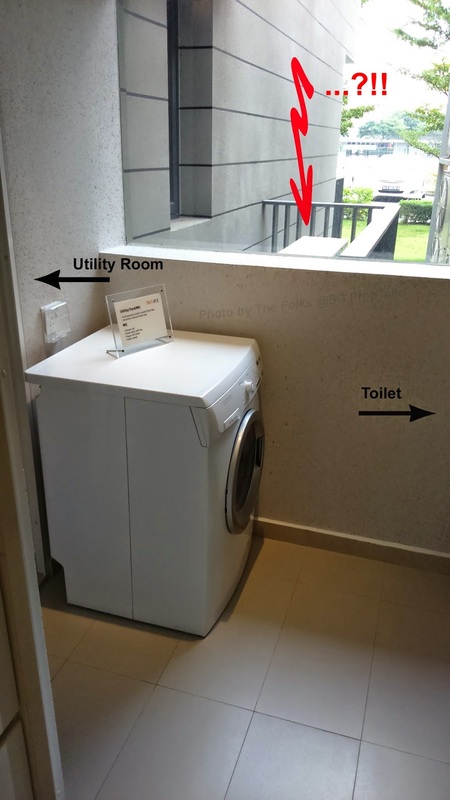 And if the showflat is indeed built to scale, one will be rather disappointed with the amount of space that is devoted to the air-con ledge. The utility room and a small bathroom is located across from each other within the yard. The utility room is tiny - the bed that was displayed within looked suspiciously short so you may have to look for a "not-too-tall" helper if you intend to house her here. The bathroom across is small but adequate for the purpose that it is meant for. The living/dining area is probably one of the smallest that we have seen for a 1,100+sqft unit. Even the regular rectangular layout is of little consolation as there is only so much you can do with the space. And with the usual 2.8m ceiling height, it may get a tad claustrophobic once you packed half a dozen people into this area. And consistent with previous projects by CapitaLand (i.e. 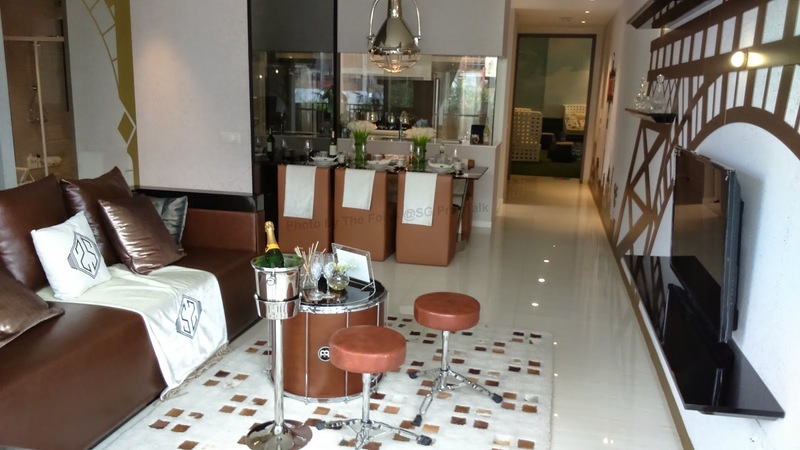 Interlace and d'Leedon), you only get homogeneous-tiled floors in the living/dining area. The two common bedrooms are also the tiniest that we have seen in awhile. To compensate for the lack of space, scaled-down furniture are used to decorate the rooms - including a shorter than usual single-bed. And we really felt that the "double-decker" concept of having the bottom as a writing/working area and a bed overhead in one of the bedroom was a really terrible idea: the ID design actually enhanced rather than attenuate the inadequacy of space within the bedroom - you are likely to get the "ceiling in your face" feeling while lying on the elevated bed, given the "normal" ceiling height. The biggest surprise was reserved for the common bathroom. The wife and I were rather perturbed to find a "modular-looking" shower stall inside. Such dated and "not so eye-pleasing" design was popular with condo projects back in the late-80s/early-90s and had largely gone out of fashion in the last 5 years at least. Thus we did not expect it to "resurface" in new developments these days... especially not in a project that is going at $1,500psf! The master bedroom was more decent in terms of space, although you will have to make do with a queen-sized bed to squeeze out those extra space. 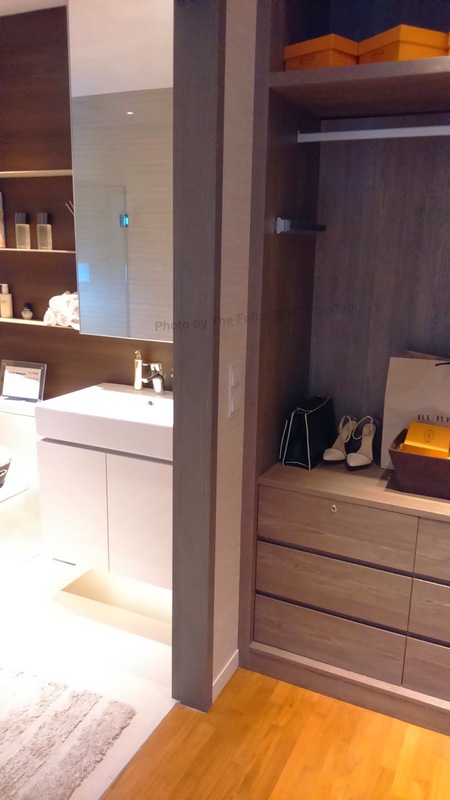 We also liked the walk-in wardrobe installed between the bedroom and bathroom, which seems to provide a bit more storage room than the 2-panel wardrobe that you typically get in other projects. 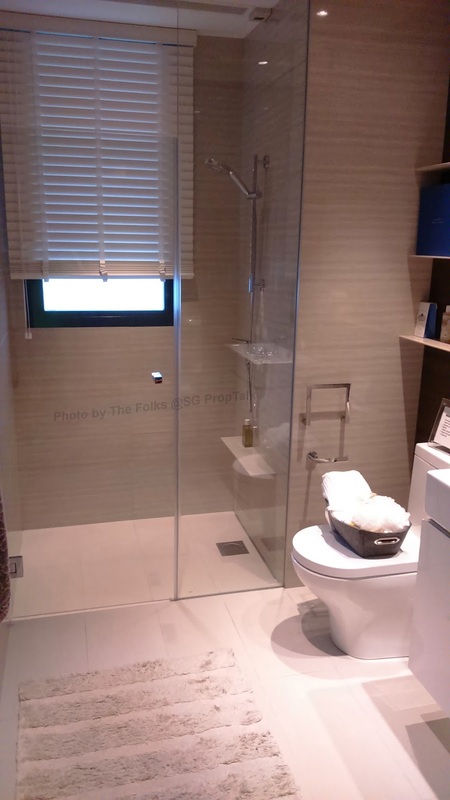 The master bathroom looked more conventional design-wise. 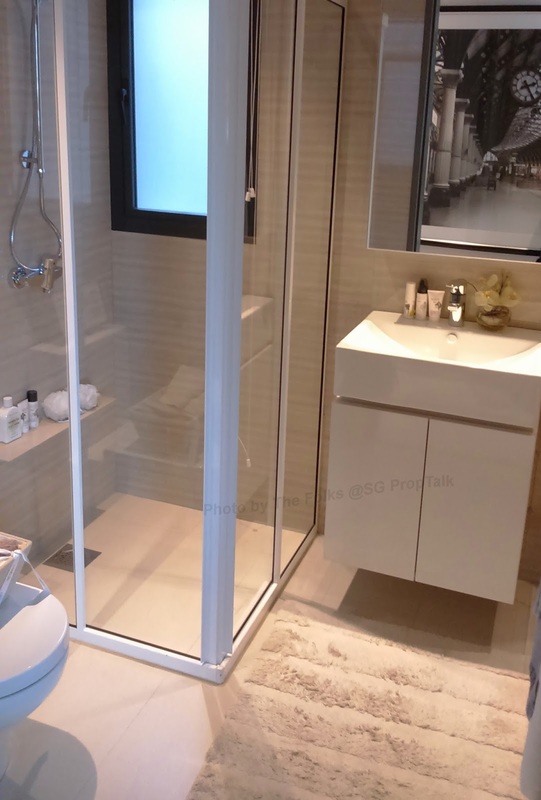 But the furnishing and fittings provide little in terms of "luxury" (at least not by our standards anyway) compared with other projects that we have seen recently. Price-wise, a 3-bedroom unit on the 25-floor is asking for $1,736,200. This translates to about $1,522psf. There are still quite a number of high-floored units available for choice. 1. 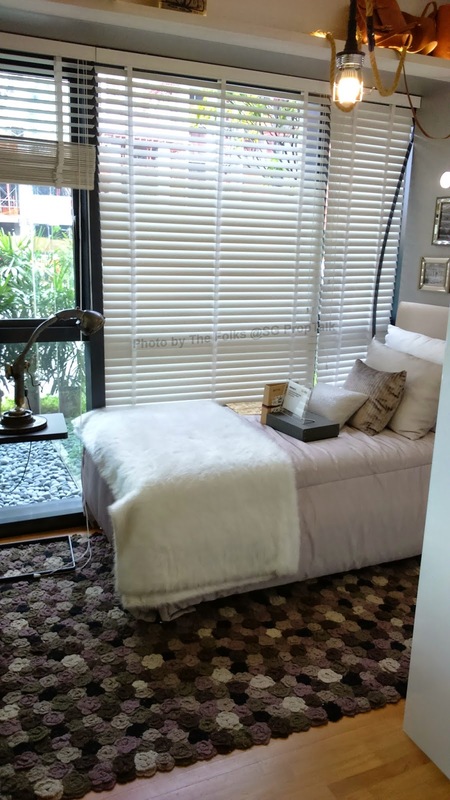 Location of Sky Vue is a big plus - it is situated within a short walking distance from Bishan Central, where you find Junction 8, Bishan Bus and MRT interchange. Matter of fact, the entrance to Bishan MRT is supposedly a less than 5 minutes' walk away. 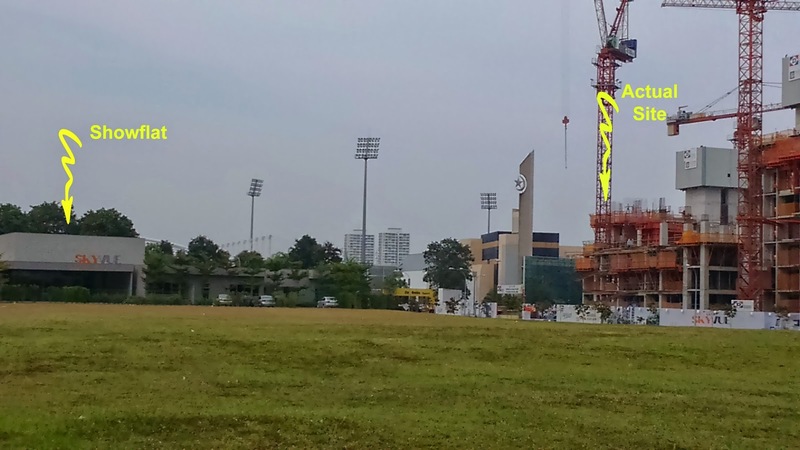 And for those who are really into sports, across from Sky Vue on the opposite side of Bishan St. 14 is the Bishan Sports Hub, comprising of the stadium, swimming complex and sports hall. 2. For those with primary school-going kids, there are quite a few choices in terms of primary schools that are located within 1-km of Sky Vue - Catholic High, Kuo Chuan Prebyterian, Guangyang Primary and Townsville Primary. So parents with no affiliations may breath easier knowing that they still have several options through the "proximity" route. 1. 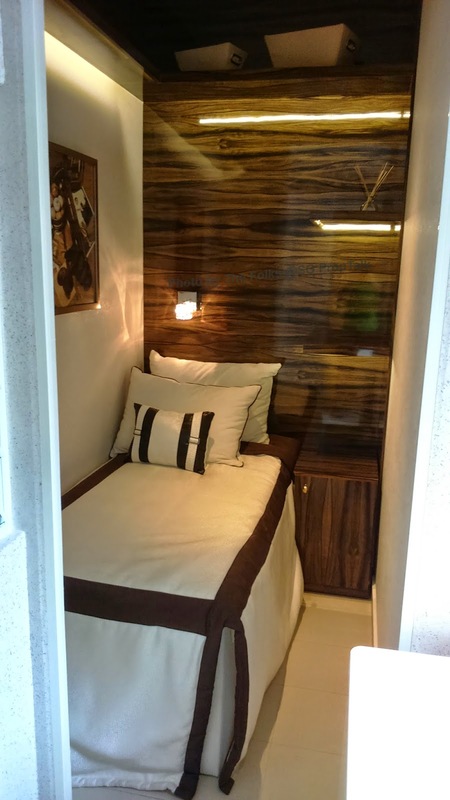 The amount of living space within the unit is by far the smallest that we have seen for apartments of similar size. 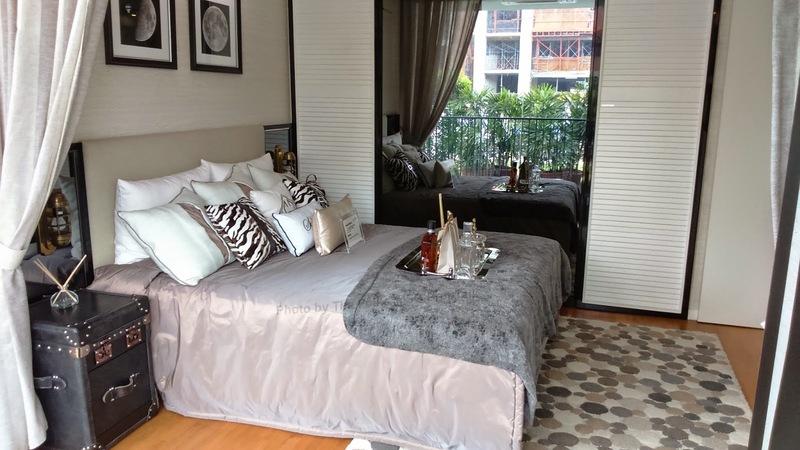 The 3-bedroom apartment can ill-afford two sets of balcony (one in the living area and the other in the master bedroom), while we have already mentioned about the disproportionately large air-con ledge. 2. The furnishing and fitting provided are not exactly on par with the project's asking price. At $1,500psf, the wife and I were rather disappointed with the quality aspects of the apartment. 3. Given that both Sky Vue and Sky Habitat actually reside on sites that are almost similar in size, the later definitely looked more "majestic" compared to the former. Everything within Sky Vue looked as if they been "squashed together", which gives it a rather "stingy" look. 4. For those outward-facing units within Tower 1 (i.e. facing Junction 8/Bus Interchange), your unobstructed view will last as long as the open space in front of your development remained undeveloped - the current empty site is slated for high-rise residential development under the URA master-plan. 5. 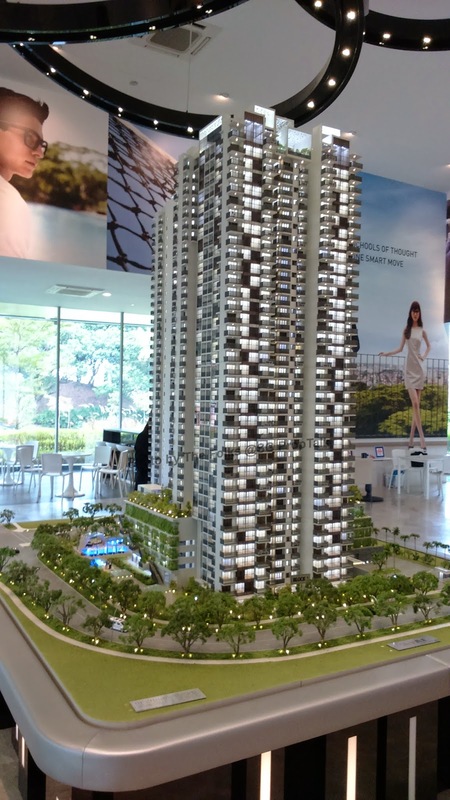 With over 1,200 apartments between the two developments (Sky Vue + Sky Habitat), Bishan St. 15 is likely to be a rather busy stretch of road especially during the morning and evening. Thus the wife and I expect quite a bit of bottleneck at the two ends that merge into Bishan St.14 going towards Bishan Road. 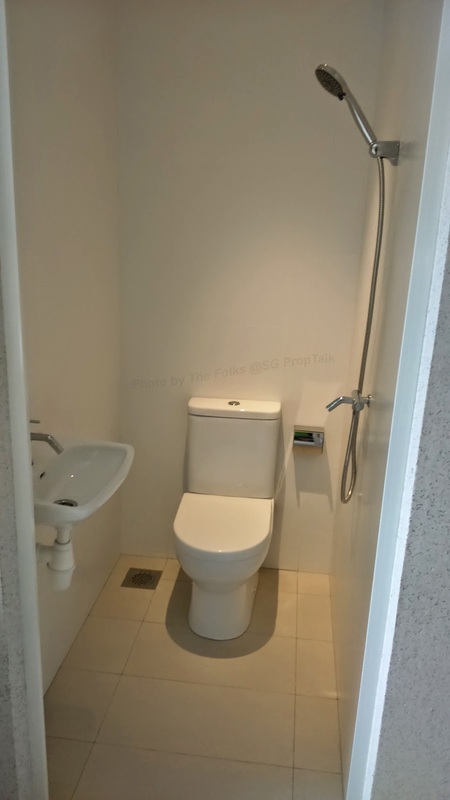 Having previously visited the showflats of first The Interlace and then d'Leedon, the wife and I have come to expect a certain level of standard from CapitaLand projects. 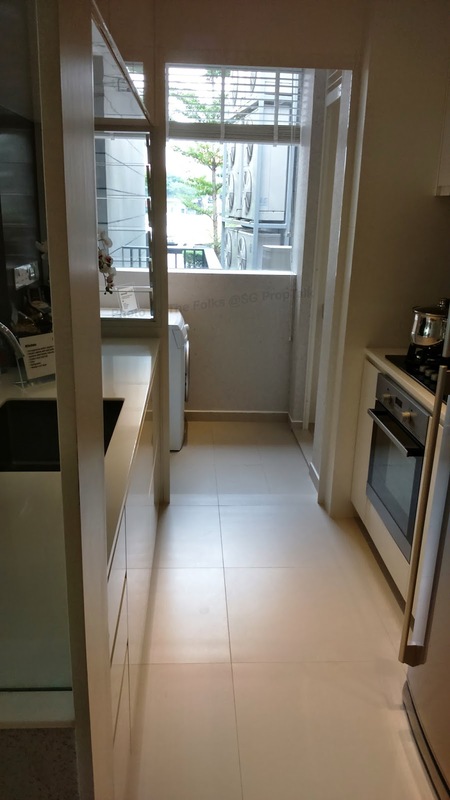 We have resigned to the fact that there is unlikely to be marble flooring, for example, but we could always be reasonably comfortable with the quality aspects of their apartments. However, this visit to Sky Vue has put a big question mark over our past beliefs. No Comment to " Sky Vue (Review) "